“As Ralph Colby peers at the microscope image in front of him, he thinks he can make them out — “shish kebabs,” as polymer scientists call them. Nobody knows for sure what they are, but these shapes that appear at seemingly unpredictable times when certain plastics cool have a big impact on the overall properties of plastics. It’s not a big deal when a plastic fork breaks, but if a bearing cage on an airplane were to break, it could put people in danger. Colby has partnered with two other Penn State researchers to get a better basic understanding of how plastics cool from a liquid to solid shape in injection molding. Their work, which involves some new techniques, is already helping industry partners. “Ultimately, we’re hoping to come away from our research with a better basic understanding of how these polymers crystallize during flow, and also the knowledge to put this information into injection molding software,” said Colby, professor of materials science and engineering. Most plastics are produced by injection molding, a process through which small pellets of plastic are melted, forced into a mold of a shape and quickly cooled. In melted form, polymers are like a bowl of spaghetti, with individual molecules being a disarray of noodles. As they cool down, they start to form a structure and this process is known as crystallization. The way crystals form can affect the strength, durability and other properties of the material. The goal of injection molding is to get polymers to orient themselves and crystallize in a specific fashion. It’s not as simple as just heating and cooling the material; rather, it requires the right amount of pressure and temperature to make individual molecules play nicely with one another and get into the right order. Injection molding is complicated enough that it requires the use of software to control different parameters of the machine throughout the process. That software is based on data from decades ago that sorely needs to be updated, said Alicyn Rhoades, assistant professor of engineering at Penn State Behrend, which has a renowned plastics engineering technology program. “Since the 1950s, polymer engineers have been designing manufacturing processes like injection molding with baseline data that was generated with plastics changing 10 degrees per minute — but in manufacturing, polymers are subject to cooling at a rate of anywhere from 10 to 1,000 degrees per second,” she said. The rate of heat transfer, either into or out of a polymer, makes an incredible difference in how a polymer behaves once it cools down. It’s similar to cooking, said Rhoades. Putting cake batter in the oven makes a far different product than plopping it on the griddle. Rhoades knew she would able to achieve the levels of heat transfer relevant to injection molding if she used a device known as a flash differential scanning calorimeter, or Flash DSC. The machine heats small amounts of polymers up thousands of degrees in a fraction of a second. Rhoades began discussing the issue with General Motors Company, and the research concept immediately struck a chord with their polymer engineers. In 2013, GM made a gift to Penn State so that Rhoades could purchase a Flash DSC. “Groups around the world use the Flash DSC to study glass or for pharmaceutical research, but we are the first to be using it for plastics engineering,” she said. 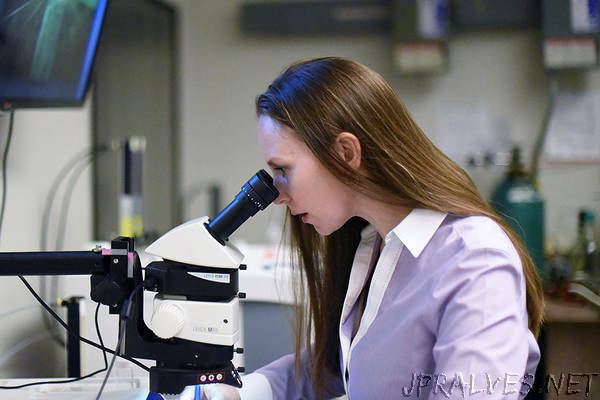 Rhoades travels to the University Park campus often for her research to make use of the Materials Characterization Laboratory, part of the Materials Research Institute. The lab is designed to characterize, or quantify the properties of, different materials. In her research, Rhoades knew she was missing a crucial piece: rheology, or how fluids behave while flowing. Luckily, Rhoades knew just the person who had the polymer rheology expertise to complement her applied engineering background: Colby. The two had met at a National Science Foundation event in Washington in 2014 and had planned to collaborate. One day, while dropping off samples at the MCL, Rhoades showed up unannounced at Colby’s office. Working with Colby also opened the door to a second collaborator, Scott Milner, the William H. Joyce Chair Professor in the Department of Chemical Engineering, whose expertise in theoretical polymer physics added to Rhoades’ and Colby’s backgrounds. The bulk of the trio’s experiments mimic what happens during injection molding. They take a sample of material in solid form, heat it to just above its melting point, apply a force to the material to simulate how it flows into an injection mold and then, once the sample has been allowed to cool, they study it. To inform what types of experiments they should run, the scientists rely on theories of how polymers should behave in different contexts. That’s where Milner’s expertise in theory comes into play. Milner’s work in this project involves modeling what happens to individual polymer molecules as they are subjected to the forces of injection molding. He runs computer simulations that solve physics equations for each molecule, indicating where each molecule is likely to move in the next moment and what force it might apply to nearby molecules. This gives a picture of how molecules are likely to be oriented once they cool into a static shape. The amount of computing power required for this type of work can’t be done on one desktop alone; instead, Milner relies on the Penn State Institute for CyberScience’s Advanced CyberInfrastructure, a robust set of research computing tools available to Penn State researchers. Milner has been collaborating with Colby since joining Penn State in 2008. The two first met decades ago, when Colby was working for Kodak and Milner was a postdoctoral researcher with ExxonMobil. Milner cites Colby as one of the reasons he came to Penn State. “I wanted to know what kind of people there were to collaborate with, and it seemed attractive that Ralph was at Penn State,” he said. Their collaboration gained new heights when the two co-advised a graduate student from 2012 to 2015. It was then that they began studying the effects of flow on polymer crystallization. By the time Rhoades connected with Colby, the trio was ready to dive into the issue of flow-induced crystallization. Already their initial experiments have shown other mysteries taking place within liquid plastics subjected to flow, in addition to the somewhat spontaneous rice grains and shish kebabs. For example, if a polymer is melted only briefly, it seems to “remember” its molecular orientation as a solid, said Milner, and recrystallizes into that much more quickly than if it stayed in liquid form for longer. Each new experiment the team takes on is yet another attempt to peek under the hood of polymers crystallization, and their goal is to use this new knowledge to update injection molding software. This could save companies hundreds of thousands of dollars, said Rhoades, in addition to ensuring the durability of their products. The team has been working closely with two major players in the plastics industry: GM, which makes a variety of products for the automotive industry, and SKF, which specializes in high-end engineering thermoplastics for the aerospace industry. Some of their work is already being fed into injection molding software so that it more accurately predicts how the final plastic product will behave. But there’s still much work to do, and many unknowns to solve. The key to making more progress, Rhoades believes, lies not in one person examining the problem but in a collaborative approach.